Heat a wok or large cast iron skillet to very hot. Add sesame oil and heat to almost smoking. Add asparagus and do NOT stir for a few minutes, you want the asparagus to begin browning. 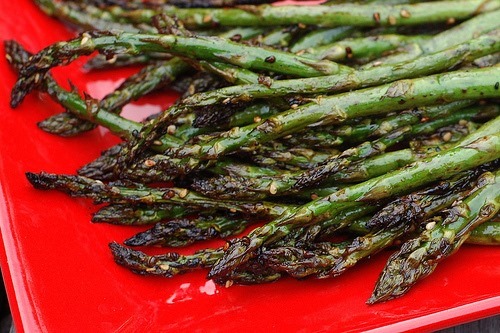 Then toss in pan and continue cooking for about 2 or 3 minutes, until asparagus is bright green. Add Bragg’s (or gluten free tamari) and stir briefly. Serve immediately.